Pretty, isn't it? A little fiddly, but well worth it. Grease a baking tray and two 10cm chef’s rings with butter. 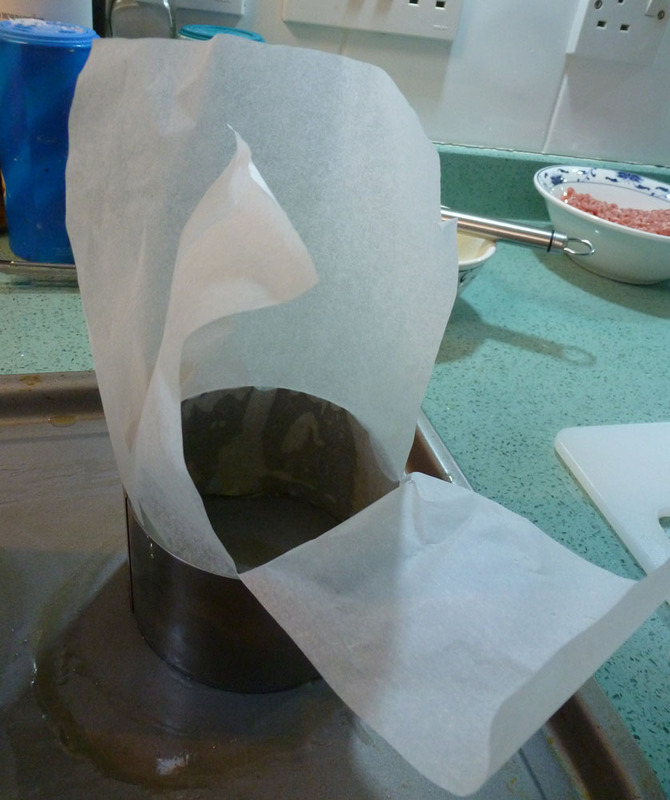 Cut two strips of greaseproof paper about 18-20cm wide. Use these to line the chef’s rings. The surplus will stand up above the chef’s rings to form a collar. 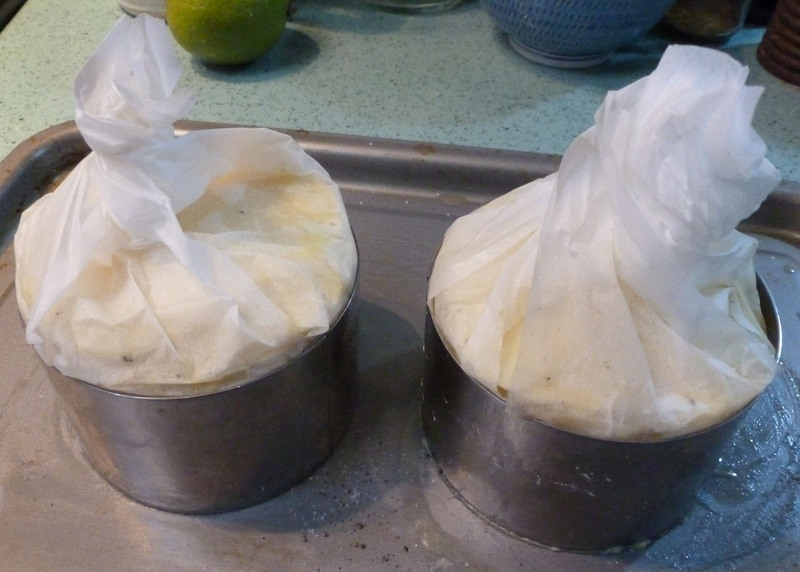 This will support the finishing potato slices that make the lid, and will also be twisted together to seal the parcels so that the ‘pies’ can undergo a long, slow cook in the oven without over browning. Make a couple of slits in the collar down to the top of the rings so that you can get in there for construction purposes. Paint the greaseproof that is inside the rings with more butter. Make sure you can pull the strip down so that you can work inside the ring. Peel and VERY thinly slice the potatoes. They need to be thin enough to be flexible so that you can snugly line the rings, especially the all-important bottom where the ring meets the baking sheet. We’re aiming at a perfectly sealed pie filling that can simmer in its own juices without bubbling out all over the baking sheet. Begin lining your rings by sticking the thinly sliced potatoes around the bottom and sides, until you have used about three quarters of the potato slices. 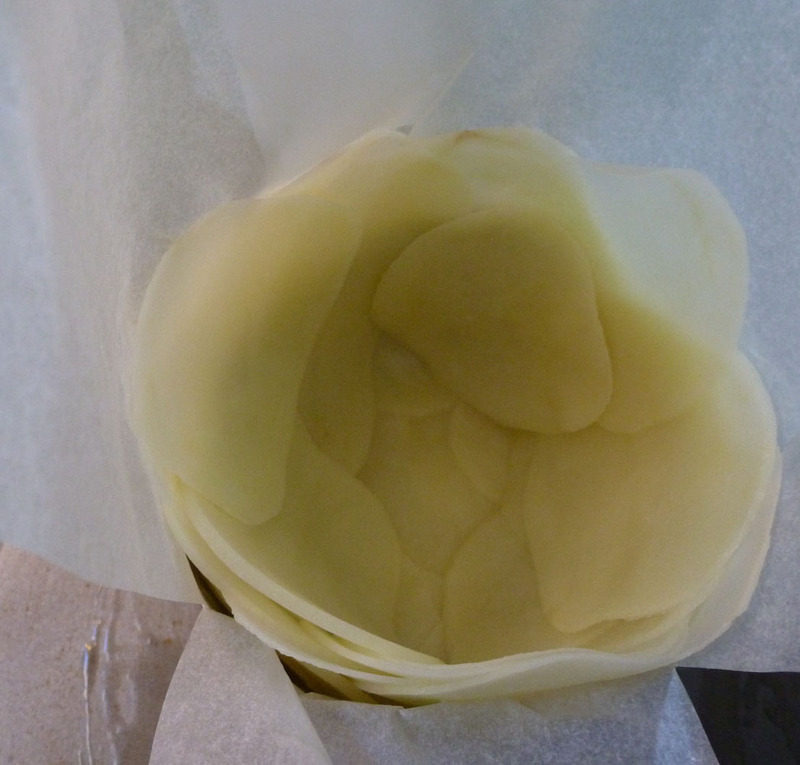 Try to extend upwards beyond the tops of the rings by a couple of centimetres – you can fold this back over your filling. Any thicker, non-flexible slices – let’s face it, there always are some! – can be used on the base and the lid. 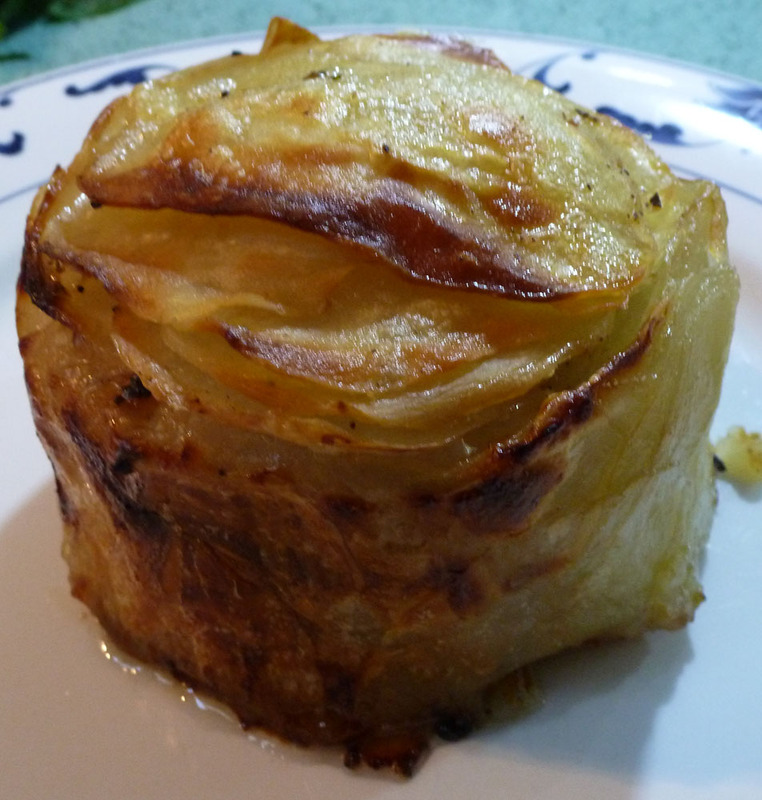 Lining the ring with potato slices. Make sure you seal the bottom edge with plenty of thin slices, to keep in all those lovely juices. Finely chop the onion and fold into the mince, along with salt and pepper to taste. Divide the mixture in half and push into your waiting potato cases. Fold any sticking up potatoes over the top, then divide the rest of the potatoes and put on top to form lids. Season and brush with plenty of melted butter. Foldy, foldy - slap on the butter and seasoning! 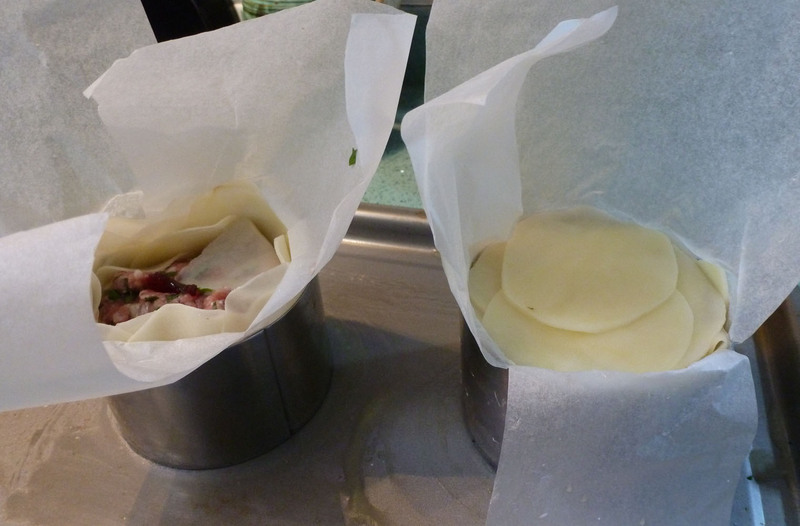 Twist the greaseproof paper to firmly seal the ‘pies’, and bake in the oven at 180°C for 1hr–1hr 30mins. Test that the potato is tender by poking with a fork. When it is, turn the oven up to 220°C, whip the rings and greaseproof off the pies and cook for a further 15-20mins until crisp and brown. Serve with green vegetables and a good gravy or tomato sauce. Seal them with a twist and let them steam in their own goodness! I’m thinking of loads more fillings that can go in these, especially incorporating a blob of something exciting in the centre of the burger. My next project will be with minty lamb mince and a blob of redcurrant jelly in the middle. The filling of lamb and redcurrant jelly. 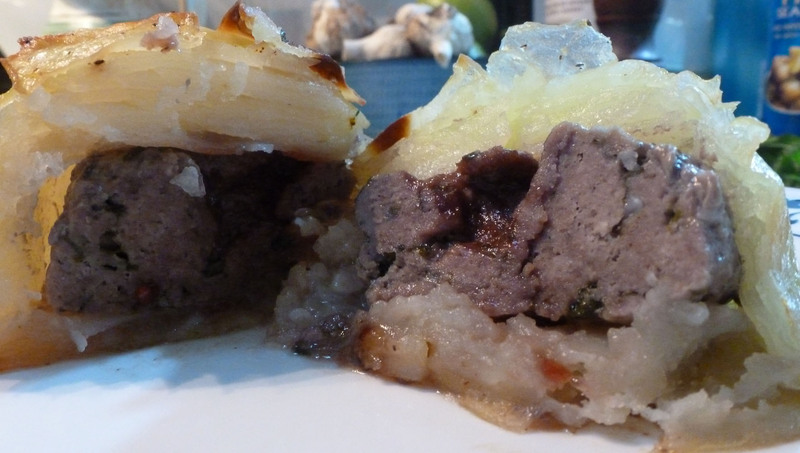 I suppose it's just a more glamorous way of serving cottage pie, but it does give a bit of a 'wow!' to some cheap ingredients. Can I put a boiled egg in the centre, surrounded by minced bacon? I like Cornish pasties and pork pies, because the ingredients cook in their own juices. This recipe is the same – nothing is lost, both in flavour and food value. In fact, could I use the traditional Cornish pasty filling of diced potato, swede, onion, finely chopped beef skirt, salt and plenty of white pepper? That’s a thought. Further experimentation will follow!